Banknote maker De La Rue, which lost the contract to create Britain’s post-Brexit blue passports this year, is still in the crosshairs of activist investor Crystal Amber. Shares in De La Rue climbed 4.5 per cent, or 21.5p, to 494.5p amid rumours that Crystal Amber was upping its stake, as it continues to pressure the firm for change. Crystal Amber, headed by City veteran Richard Bernstein, is currently the third-largest shareholder in De La Rue. It has said it is prepared to increase its stake until it gets to the top spot. De La Rue threatened to lodge a legal claim against the government in April after it awarded the passport contract to Franco-Dutch rival Gemalto, which significantly undercut De La Rue. But it later dropped this challenge, saying the ‘risk-reward does not stack up’. Since then, its shares have languished at between 470.5p and 557p – down as much as 56.4 per cent from the ten-year high of 1080p in October 2012. De La Rue implemented a turnaround plan in 2015 to make the business more technology-led, and points to the sale of its banknote paper business earlier this year as a sign of its progress, but investors remain unconvinced. They have questioned whether De La Rue’s passport and identification branch now has enough business to survive. The company is due to give further details on its plans for the division in its November half-year results. On the FTSE 250, engineering firm Weir Group warned it had spotted a weakness in its business as it met with investors. The firm, which specialises in servicing oil and gas rigs and mining infrastructure, said that there had been a ‘considerable softening in demand’ for its equipment towards the end of the summer. Earlier this week, Weir’s US competitors Halliburton and Schlumberger set alarm bells ringing when they noted that a surge in oil and gas production in Texas meant barrels were being pumped faster than they could be moved. This backlog has caused the price of oil to slide, which poses a threat to drilling activity. Brent crude was trading yesterday evening at around $76.5 per barrel, down for the second day in a row from $78.2 on Tuesday. A sustained drop in oil prices could be bad news for Weir, which has said some orders had been ‘deferred’. Its shares ended the day down 8.6 per cent, or 154p, at 1632p. The FTSE 100 ended the day down 0.9 per cent at 7319 points, a near-five-month low, as gains from British Gas owner Centrica failed to pull the index up. It climbed 5 per cent, or 7.2p, to 150.6p after the Government’s price cap on energy bills proved less fiery than anticipated. But miners still weighed heavily on the index amid trade war fears. On London’s junior market, Brave Bison – which produces video adverts for social media – shot up as it made a major breakthrough in China. It sealed a deal with Tencent, one of the world’s largest internet companies, allowing it to post videos on WeChat, the major messaging, payments and social media app in China. Brave Bison said this would give it access to more than 1.5 billion viewers, cracking open a market currently inaccessible for most Western advertisers. 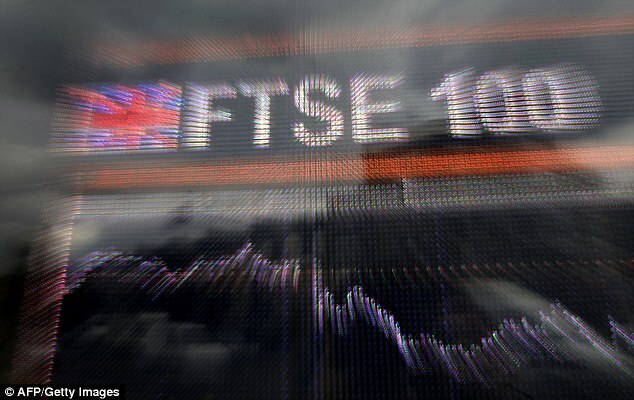 Its shares shot up 60 per cent, or 0.9p, to 2.4p. But biofuel company Velocys, which makes jet fuel from forestry by-products, took a nosedive. It is a major lender and shareholder to Envia, a US biofuel plant which is under threat of being closed if it does not become profitable. Velocys’s shares ended the day down 13.9 per cent, or 1.2p, at 6.71p.